As children, Meaghan Howe and Doug Stoinski cherished their families’ Northern Michigan vacations. Their shared love for the area made it easy to choose to be married at The Homestead in Glen Arbor. Meaghan was thrilled to be able to share the special moment with her grandfather, and hockey legend, Gordie Howe. 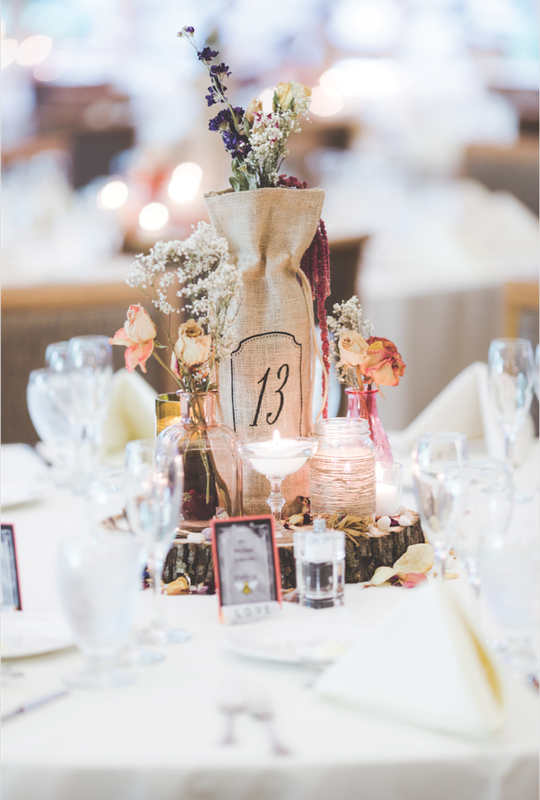 The couple treated their guests to some of their favorite memories with local delicacies from Grocer’s Daughters’ Chocolates and Cherry Republic and a collection of places to visit in the Sleeping Bear Dunes National Lakeshore. The Homestead summer wedding was exactly what the couple had pictured. This article was originally published in the 2016 issue of MyNorth Wedding. Meaghan and her grandpa, hockey legend Gordie Howe, shared a tender moment at the reception. The Homestead has plenty of photo opportunities for the bridal party. Centerpieces included wine bottles in burlap, dried roses from past bouquets given to the bride from her groom and plenty of candles; the wine bottles came from Chateau Chantal on Traverse City’s Old Mission Peninsula—a winery and inn where the couple stayed the weekend they got engaged. The red couch was a photo prop a bridesmaid bought at an estate sale for $60. The wedding cake, by Top Tier Cakery, was iced to look like birch bark and featured a heart with the couple’s initials, as if carved into a tree. Doug’s sister made the bride-and-groom cake toppers. Meaghan and Doug slipped away to soak up the sun setting over Lake Michigan. During a hike on Empire Bluffs Trail, with its majestic and sweeping views of Lake Michigan, Doug Stoinski and Meaghan Howe decided to spend the rest of their lives together. 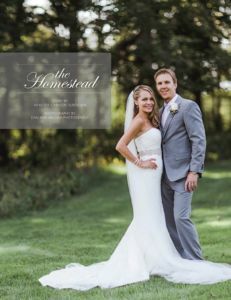 That outing also led the Bloomfield Hills, Michigan, couple to decide to have their wedding, nearly two years later, at Glen Arbor’s The Homestead resort. “The Homestead is the closest resort to the trail where we were engaged,” says Meaghan, who like Doug, vacationed in Northern Michigan as a child. 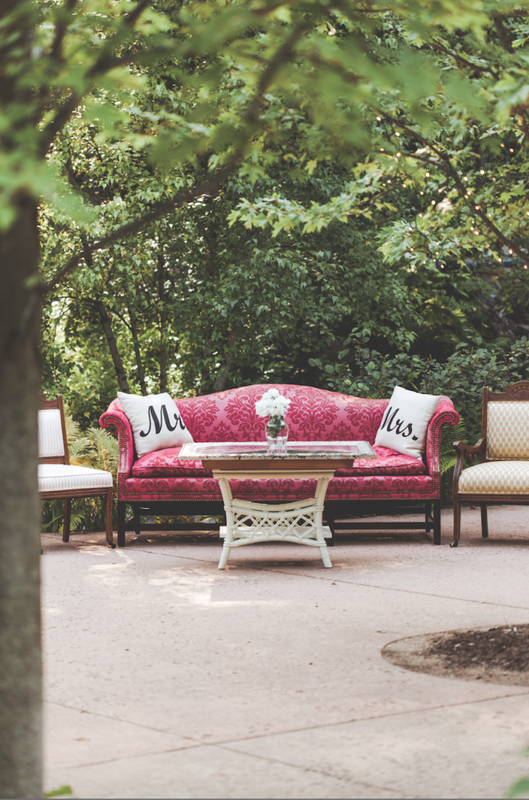 “It was really special that we picked this place … We just felt that The Homestead had all of the elements of the atmosphere we wanted to create,” says the bride, adding that she loves the resort’s connection to the outdoors combined with its upscale amenities. “It feels magical when you pull in,” Meaghan says. Click here to view Meaghan and Doug’s wedding in the 2016 MyNorth Wedding issue. Having a vacation-worthy location for guests was also important—many of them stayed on site and for multiple days. To welcome guests to The Homestead, Meaghan and Doug provided a sampling of local treats. They offered delicacies from Grocer’s Daughters’ Chocolates, a gourmet chocolatier based in Empire, and tasty items from the Glen Arbor–based cherry-themed business, Cherry Republic. The couple also provided information about hiking and places of interest in the beautiful Sleeping Bear Dunes National Lakeshore that embraces both Empire and Glen Arbor. Meaghan Howe, granddaughter of hockey legend Gordie Howe, and Doug Stoinski were married August 22, 2015. The 1 p.m. ceremony took place at St. Philip Neri Catholic Church in Empire, where bunches of lavender adorned the pews. After making the short drive from the church to the resort along the acclaimed scenic highway M22, guests were treated to an outdoor cocktail hour followed by the reception at The Homestead’s elegantly rustic Mountain Flowers Lodge. The remainder of the evening carried on that intimate feeling. “Our goal was creating for our guests an experience showing what we love about being Up North, and having them be able to celebrate that with us,” Meaghan says. Find more inspiration in the MyNorth wedding directory.